New York, NY (May 11, 2018) – This week Swiss watchmaker Parmigiani Fleurier celebrated the culmination of their artistic collaboration with Italian painter Marcello Lo Giudice during an exclusive opening ceremony for his exhibit “Eden Universe, Eden Ocean” at Opera Gallery in New York City. 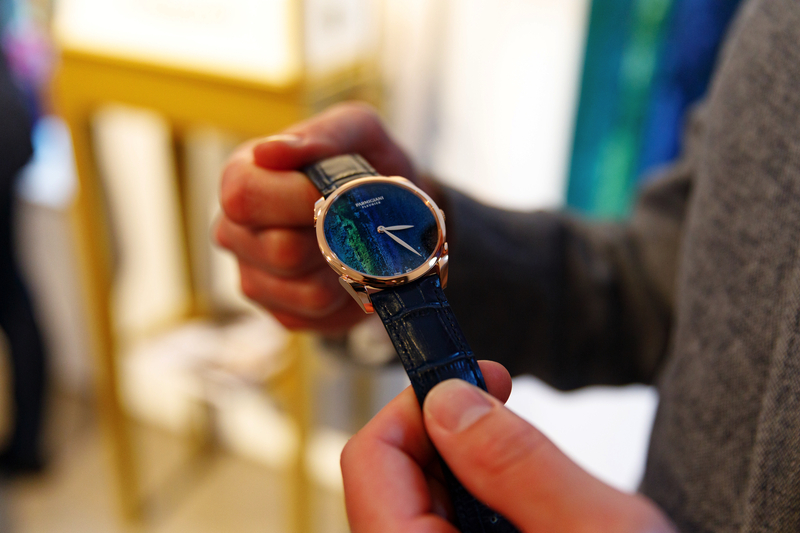 The vernissage honored the launch of Lo Giudice’s new collection and the special edition Parmigiani Fleurier Tonda 1950 Marcello Lo Giudice timepiece. Each of the twelve timepieces feature identically reproduced portions of Lo Giudice’s artwork. Parmigiani Fleurier’s founder and CEO, Michel Parmigiani, embarked on a personal journey to find new inspiration for his world-renowned haute horology pieces. Captivated by Marcello Lo Giudice’s latest works, with abrasions and bold color cascading across the abstract landscape, an embodiment of the cyclical relationship between man and material, Parmigiani found his newest muse and began to blend these two unique worlds of craftsmanship. To achieve these twelve dials, each of them a one of a kind masterpiece, Parmigiani Fleurier employed a laser technique of the utmost precision. On the raw plate of the dial, the beam engraved its trace and marked the material’s structure, in order to build volume where there was a flat surface. Then the miniaturist painter applied the color pigments, identically reproducing a selected portion of his artwork “Eden Universe, Eden Ocean”. It was of great importance to Parmigiani that the process remained true to Lo Giudice’s work, who starts by building texture and volume on a canvas before covering it with color. The special edition Tonda 1950 Marcello Lo Giudice comes with thinner hands, said to have a “sage leaf” shape, in order to adorn the frescos of the dial without concealing it. The rose gold case is engraved with an individual number, the title of “Unique Piece” and the two names “Marcello” and “Michel” side by side – a tribute to the friendship born from this collaboration. The exhibit has been visited by several influential guests from around the world including Prince Albert of Monaco, a close friend of the artist. Attendees perused the larger-than-life works of the artist throughout Opera Gallery as well as Parmigiani’s corresponding miniature limited edition piece, with the chance to ask Lo Giudice about his work and new collaboration. 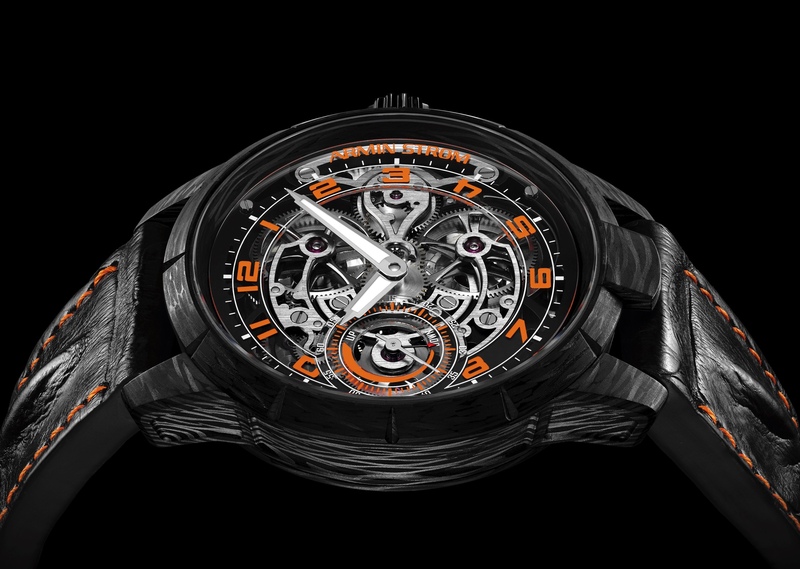 The first of the twelve unique timepieces which “opens” the series was presented to Prince Albert of Monaco, while the last, which brings the series full circle, was gifted to Lo Giudice. It is easy to see why Michel Parmigiani was so inspired by “Eden Universe, Eden Ocean,” with its thick layers of deep, moving blues providing existential significance of that which is greater than us, like time – ticking forever forward. Marcello Lo Giudice’s work runs parallel with Parmigiani Fleurier’s passion for design, innovation and the beautiful history of time itself.